Each of our classrooms is personalized to the needs of each individual students. Our students sit in small groups where they learn, practice, apply and assess their learning knowledge and skills appropriate for their level. They demonstrate evidence of their mastery of their learning targets in classrooms designed around a shared vision, common language, routines, rituals and restorative practices all designed to foster student centered learning. Students have their choice of many ways to learn everyday. We have identified some of the best online tools to help students determine how they learn best. Some of our students may enjoy a video explanation or to try digital practice problems to learn the objective, at Merit Prep students get choices to personalize their own learning. At Merit Prep students and staff use technology to innovate in the classroom. Each student gets a laptop that they can use with all of their courses and electives. The laptop allows our students to explore and create every day. The Matchbook Learning model is centered around the needs of each individual student. 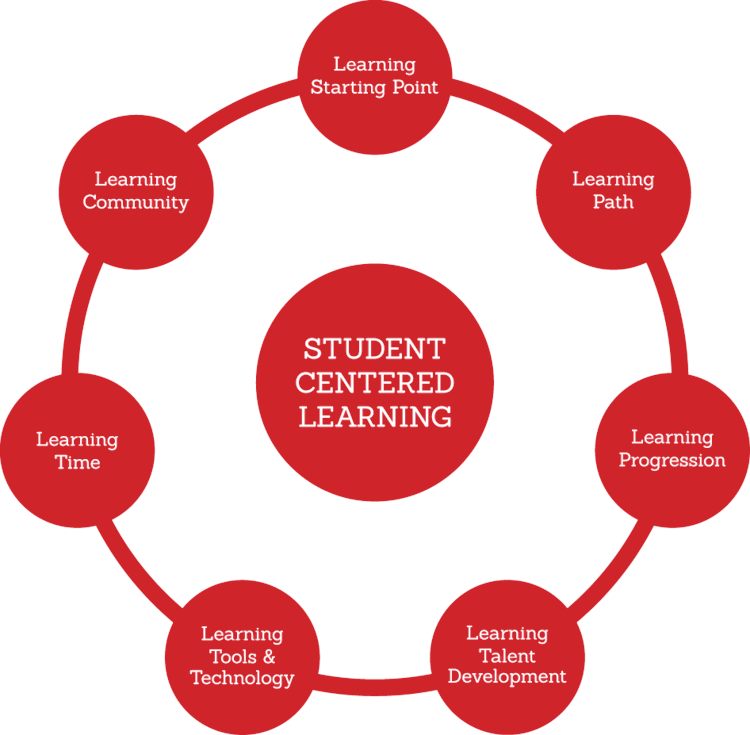 We call this a “student centered learning” model of school and our model has 7 key design elements to it. Traditional schools begin the student’s age or grade level without regard to actual academic ability. A students’ age, for example, may place them in the 7th grade even though they are advanced in Math and behind in Language Arts. During their first week at a Matchbook school, students are assessed to determine their starting level by core subject area. We keep students in their grade-level cohort but start them wherever they are academically in each subject. Everyone eventually crosses the same finish line, but Matchbook tailors students’ starting points according to their competencies. This helps challenge students where they excel and catching them up where they lag behind. Our promise to students is…your starting point will combine the right amount of challenge with heavy helpings of fun and opportunity. Traditional schools provide students with one textbook per subject and one learning path per class. But Matchbook believes in the power of choice, so we offer numerous learning paths and let students select how to best learn a particular concept. These learning path options (think iTunes playlist) include small group instruction, one-on-one teacher conferencing, group projects, self-directed study, multi-media engagement, online games, videos, and virtual instruction. Our promise to students is…you will have control over your learning path because you know how you like to learn better than anyone. Traditional schools let teachers determine when students are ready to progress. Since students move as whole classes, this often means the entire group advances when the majority is ready, leaving a small faction behind. In Matchbook’s SCL model, a student progresses to the next learning target when they demonstrate mastery of the current target. They must individually prove they can apply what they’ve learned through projects they’ve designed. These projects are graded by the teacher as well as outside experts providing every student meaningful feedback. Our promise to students is…you will only be assessed on your performance after you’ve demonstrated mastery of the material. Traditional schools struggle to train teachers beyond the education they’ve received in school. Because of the immense energy required to perpetuate the current system, little is left for equipping and growing teachers. Matchbook knows that teachers matter, so each instructor at our schools receives 40 observations, 20 one-on-one coaching sessions and four quarterly goal-setting sessions per year. Just like our students, we meet every teacher where they are and provide them options on how to develop and progress along a continuum based on their demonstrated mastery of our model’s implementation. Our promise to students is…you will always have a highly qualified teacher in your classroom that is as passionate about learning and committed to your success as you are. Traditional schools notoriously struggle with implementing and utilizing new technologies. Matchbook Learning provides the latest educational tools to their students, including internet-ready laptops loaded with proprietary software, Google applications, and digital curriculums. We know technology can never replace a competent teacher, but when used appropriately, it can help teachers keep track of every pupil, provide students real-time feedback on their progress, and create multiple ways for students to learn. Our promise to students is...you will be empowered with the latest technology tools to help you succeed in school. Traditional schools often adopt a one-size-fits all approach to learning time. But students often learn at different paces in different subject areas. That’s why learning time in a Matchbook classroom is always varied, multi-dimensional, and student-driven. Students’ time is the most precious resource our parents are asking us to steward. Matchbook commits to managing it effectively. Our promise to students is…your time will always be engaging, interactive, worthwhile, and never boring. Traditional schools are run like institutions, which of course, they are. But they should also be more than that. A Matchbook school is first and foremost a community and family. Families have chosen to attend our schools rather than being forced. We take their choice seriously. A key to a healthy family is effective communication, so Matchbook principals update parents on their children’s progress, not just through formal means such as report cards and the occasional newsletter, but through face-to-face conferences, access to their student’s work, group presentations, principal “coffee talks,” and updates on our website’s blog. Each parent is given the personal contact information for their student’s teacher and is encouraged to reach out anytime. Our promise to students is…we will partner with your family to develop you as a future leader and will hold ourselves accountable to listen and consider before responding.